Let’s face it, regardless of the size of your business the burden of accurately calculating, collecting, and remitting transactional taxes is a challenge—and not just because historically managing these tasks has involved cumbersome and inaccurate manual processes or expensive enterprise hardware and software systems. It is also a challenge because of a host of mandates regarding compliance. In short, governments not only expect but demand you get these calculations and payments right and that there is an accurate record for auditing purposes. Realities are that thanks to cloud-based software platforms designed specifically for handling the complexities of sales and use tax compliance, companies can now outsource these tasks to a trusted third-party. Tax Rate Calculation: Avalara Ava instantaneously and accurately calculates tax in more than 10,000 taxing jurisdictions. Exemption Certificate Management: Avalara CertCapture creates, validates and stores sales tax exemption certificated and reseller certificates in the cloud. Critical questions to ask whether or not you have nexus. For those not familiar with the term this is about whether there is sufficient physical presence for determining whether an out-of-state business selling products into a state is liable for collecting sales or use tax on sales into the state. Nexus is required before a taxing jurisdiction can impose its taxes on an entity. 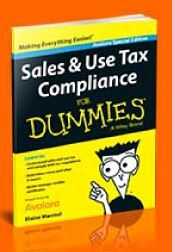 As an incentive to registrants, not only will you have the opportunity to hear Scott’s presentation and ask questions, but you will also receive a copy of the book, Sales & Use Tax Compliance for Dummies. For anyone grappling with the complexities of being in compliance this is a must have as a reference guide. Despite the title of the webinar and the book, both are seriously aimed at making you proficient when it comes to things like knowing what you really must know about nexus, and how to better manage those all important reseller certificates. Automation and the cloud can be your path to both peace of mind and more efficient operations when it comes to those tasks that are complicated business necessities where time and money can be better spent.